This gnome has caught a fish. Yesterday's winning name continues the g-name streak, with "Gnorma" by commenter "Unknown." And the detail "Her nose is really cold" by Anika S.
Great work everyone. These stories you are posting are hysterical. The gnomes seem to be more fun to write about than the dragons were. You have the weekend for this guy--take your time! After a lot of thought, I'm gonna go with Steve. Gnernest Gnomingway, author of The Old Gnome and the Sea, with his fish Piskie (or Ishmael) . Gefforey: he tells the most fantastic "big fish stories" which are acutally true but no one ever believes them because the "big" fish always gets away. Blad the Inhaler. He spent the weekend hookybobbing behind Gottfried's motorboat, thinking this would be a great way to fish. All he has to show for the ordeal is a grey complexion from inhaling boat fumes and this tiny fish. Turns out fish really do prefer still waters. Cole: Greydor, he's a really bad fisherman. He doesn't like fish, but he catches them because his wife does. 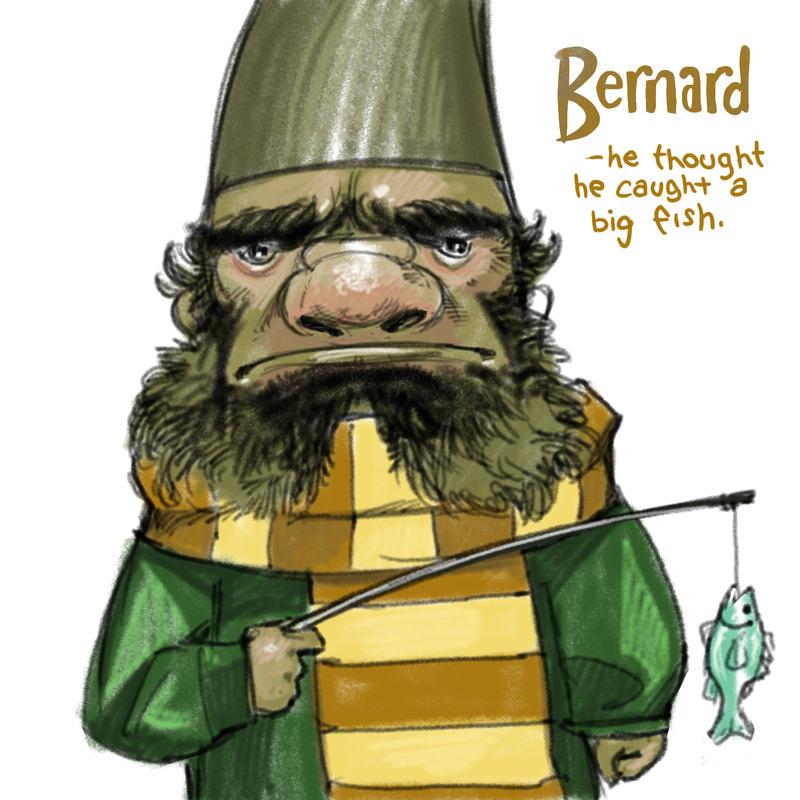 Ada: Grumpy Bonstropolis--He can only catch teeny tiny fish and that's why he's grumpy. Jeff, leader of the Fishy Clan from Fishka. He's an Ice Fisher, but hates his job. Boris Gnomekov. He comes from a remote area north of Poland. He caught this fish to bring along as a snack while watching Hufflepuff play Quidditch. Gneville. He goes fishing to get revenge on the worms. his fish is his thingy thing. Bernard. He definitely looks like a Bernard. Jonah. He used the middle of his beard for bait. Humphrey. he was named this because "humph" is the sound he makes when he thinks he caught a big fish because the line was was being pulled hard, but it turns out to be tiny. choonome. that was my verification word. Never one for excessive cheer, his mood has not been helped by the chronic cold he's had for the past twelve and a half years. The cold has not been helped by his unceasing ice fishing. His name should be Norman and he thought he caught a big fish.